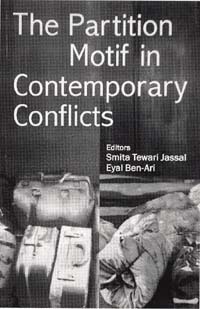 The Partition Motif in Contemporary Conflicts Eds Smita Tewari Jassal and Eyal Ben-Ari. Sage Publications. Pages 381. Rs 480. Any partition or the divide of people creates tremendous personal, social, political and economic convulsions the likes of which no human society should have the misfortune to go through. Whether it is the break-up of India leading to Pakistan, the division of territory between Palestine and Israel, the dismemberment of erstwhile Yugoslavia or a host of similar politically-motivated societal surgeries, it is a genocide of a memory and earlier way of life that has to be lamented and mourned by those who care and understand that one class of people with their own culture and identity can never be separated in the true sense of the word. The scars that remain often sow the seeds of future conflicts and turbulence. Smita Tewari Jassal who teaches at John Hopkins University, Washington, and Eyal Ben-Ari, a Professor of Anthropology in Jerusalem, have covered a wide spectrum of mind sets and opinions that might actually consider partition as a necessity, a reunification that becomes a compulsion because of the economic disparity as in Germany, or partition as a big bore at best and to be quickly forgotten as in the case of the younger generations in our own subcontinent, who never experienced or suffered from this catastrophic event. An interesting question looms large in a study of India where there are many religions, and where it has to be accepted exists a distinct and overpowering Hindu majority resting rather uneasily with Muslim, Sikh and other minority groups in our nation state. What is not pertinent as far as this study is concerned is whether it was the ambitious leadership at the time on both the sides or the brute majority that forced the Muslims to migrate to Pakistan and seek their own homeland, but the aftereffects and residual rancour that the Partition has left behind in both the countries. Sinha-Kerkhoff and Ellen Bal touch upon the official and non-official rhetoric that denied any "Muslim bashing" as in the former case, and the "Muslims who stayed" or those "who can not (always) be trusted" as in the latter category, depending on whose perception one wished to go along with. Surprisingly, besides a cursory mention of the Sikh factor by Michael Nijhawan, where he talks of the Sikh martyr texts, the picture of the Indian partition and the poison it left behind come out as if it were an exclusive engagement between the Hindus and the Muslims of the subcontinent only, with the rights and aspirations of this Third Force at the time not taken into account, and which objective analysts today would ascribe as one reason for the ongoing uneasiness that has prevailed in the Sikh-Hindu communities in Punjab ever since the turbulent era of 1980-1990s. The historians of this generation need to correct this anomaly and record the truths of history as it really shaped on the ground. The Radcliffe Line, the Durand Line, Gaza or the West Coast are man-made divisions best avoided, and Ina Dietzsch writing about borders says, " Borders, both as cause and effect of partition, simultaneously initiate and support processes of inclusion and exclusion". How can contemporary conflicts not be affected by man-made blunders and avarice? Can religious events and ceremonies like Christmas, Id-ul-Fitr, Dewali and Gurpurabs bind communities together? And as Zvi Bekerman poses a question that can they "have the power to promote co-existence and contribute toward reconciliation efforts" is a matter on which the jury is still out. What matters ultimately possibly is the desire in communities to rise among their inner selves and inbuilt prejudices and learn to forgive and forget and move on. Is the 21st century ready for this transformation? The people in both the two Koreas after its political division "have in fact become two quite distinct peoples", writes John Borneman who teaches anthropology at Princeton University. That partitions have a devastating effect on a person’s psyche and the whole outlook, what to talk of only conflicts, is beautifully versed in Namita Chowdhury’s poem The Rhyme of Refugee Life reproduced in this book: "Even today I can see/once in a while, clearly before my/eyes/innumerable figures of old men/like my father/which even while gradually/wasting away, I find are/still eager to press forward,/in the hope of survival/they want to search out/just even so small/a secure haven." This book is a social and historical study of partition that will touch many hearts.